Are you a sci-fi geek? If so, this might be just the thing to send you over the moon. If you and your friends are Trekkies, you'll want to check out Tweet in Klingon. 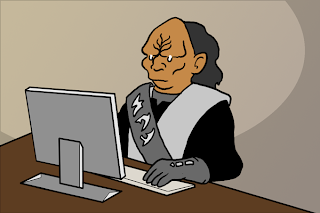 You can put in your 140 characters and it will convert your English to Klingon, and send a tweet to all your followers. DaH jaH vo' je mugh, ngan (that's Klingon for "Now go forth and translate, Earthlings."). That's pretty geekie. But then again I'm not a Star Trek fan. Thanks for stopping by the ole' blog. I'm not a Trekkie either, but those who are totally love this site. As with most things, beauty is the eye of the beholder, eh? Do you report GOOD customer service? Wanna raid a stranger's closet?